How Much Disability Insurance do i qualify for? Physicians always ask how much disability insurance they should have. In most professions you are allowed to have a total of 60% of your adjusted gross income protected with individual disability insurance. Attached to this post is a chart of the amount of individual coverage a physicians is eligible for based on his/her income. These amounts would differ if you also carry a group long term disability policy. Employer paid Group coverage will limit your eligibility but its not a dollar for dollar reduction since employer paid benefits are taxable. The post How Much Disability Insurance do i qualify for? appeared first on Doctor Disability Shop. 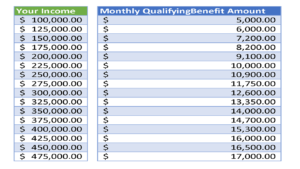 https://www.doctordisabilityshop.com/wp-content/uploads/2018/01/Monthly-Qualifying-Benefit-Amount-1-300x169-1.png 169 300 admin https://doctordshop.wpengine.com/wp-content/uploads/2016/05/logo.png admin2018-01-23 10:02:172018-01-23 10:02:17How Much Disability Insurance do i qualify for?